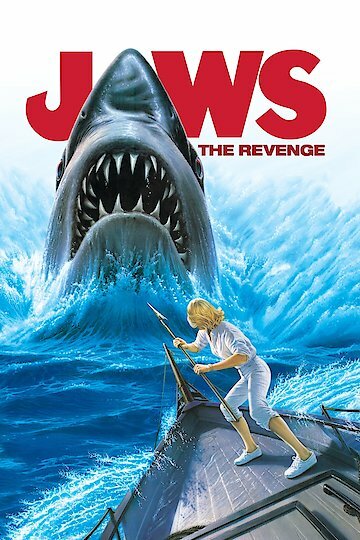 Jaws: The Revenge is billed with the catch phrase “this time it’s personal,” leading up to the fact that this is actually a fight to the death between the woman from the first two Jaws movies, and the only remaining great white shark of the family whom she believes killed her husband and son. The movie begins with the son of Sheriff Brody, and his wife Ellen Brody, played once again by Lorraine Gary is killed by a man-eating shark on Amity Island. Amity Island was the site of the first two great white attacks that terrorized the island until hero Sheriff Brody killed the sharks responsible. Brody died of a heart attack but his wife believes it was his extreme fear of sharks that actually killed him. When her son is killed Ellen is convinced that the great white is out to kill her entire family. She is even more convinced when she goes to the Bahamas to overcome her grief by visiting her son Michael and his family. She is not happy that her son is a marine biologist and loves the water as much as his father did before him. When the great white who killed his younger brother attacks his boat Michael is finally forced to realize that his mother may be right, and the shark may just be out for revenge. When Ellen first lands on the island she meets an airplane pilot named Hoagie, played by Michael Caine, who she quickly falls for. As the body count rises from the shark attacks, Ellen blames herself and decides to take matters into her own hands. She heads out to sea on her own hoping that if she gives herself to the shark the feud will be over and the beast will finally leave her family alone. This causes many more problems as Michael, Jake (his partner), and Hoagie have to go find he,r putting them in direct danger from the shark that is determined to kill them all, not to mention everyone else in its path. Jaws: The Revenge is currently available to watch and stream, download, buy on demand at Netflix, Amazon, Vudu, Google Play, iTunes, YouTube VOD online.